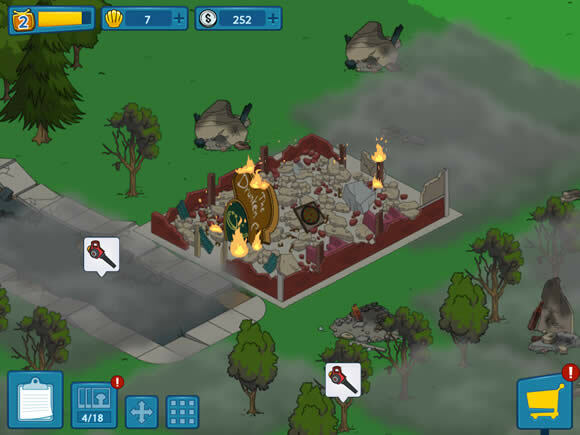 I played Family Guy: The Quest For Stuff for 3 weeks & spent £3 on in-app purchases within the first 2 days. The rest of my playtime was done without spending a penny. The best free-to-play/freenium games on iOS often seem to be builder games. The ones where you have to build up a town, park etc. & everything takes time unless you’re willing to spend real money with in-app purchases. Sadly the most money grabbing & frustrating type of game is the same builder types. For every Jurassic Park: Builder (a fair game that never felt like I had to pay to enjoy) there is a Nemo’s Reef (shockingly tricky in its attempts to take money from you). 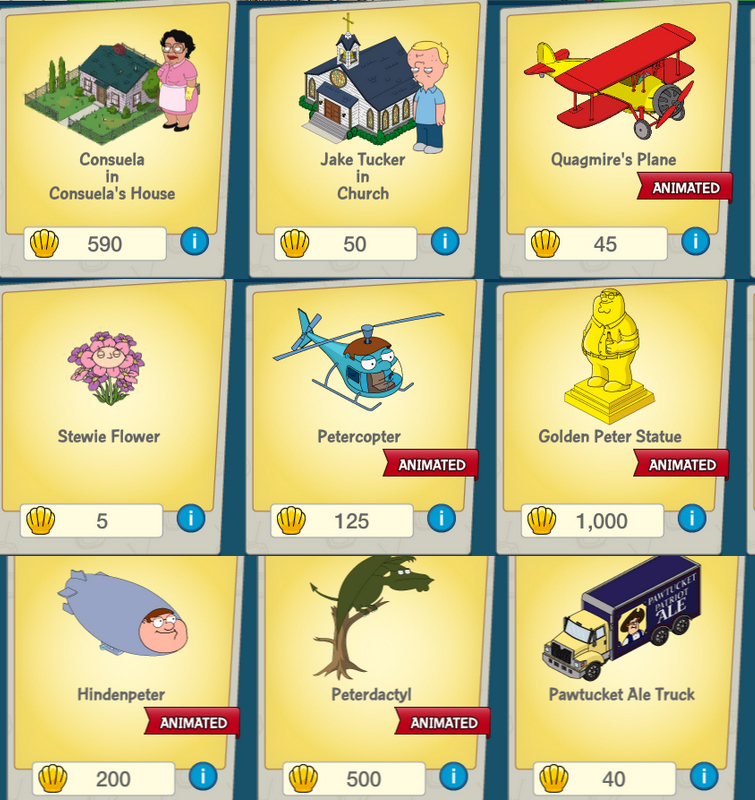 Family Guy: The Quest For Stuff lands in the middle, its fun & fair while also locking away important gameplay devices that aren’t necessary but could really help better the gameplay if you’re willing to spend big. So the story is simple…Family Guy has been cancelled again & it is the Giant Chickens fault. Peter gets into one of his infamous fights with the Giant Chicken thus destroying Quahog. 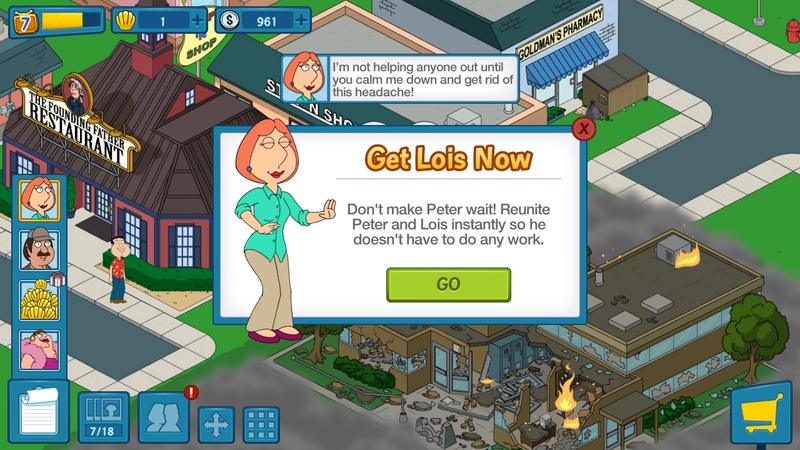 Lois sets him the task of re-building the town with the help of all your favourite Family Guy favourites. 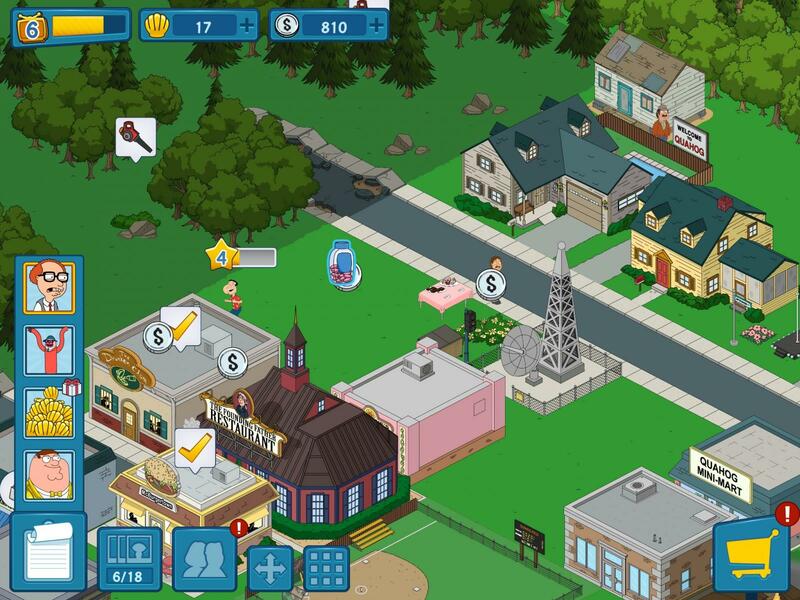 The gameplay is simple…buy buildings & other Quahog landmarks & set about rebuilding the town as you see fit. Clear debris & foggy areas using your workers of which there is one…should you want anymore hold back your golden clams or be ready to stump up some serious cash. Your currency comes in 2 parts…the basic coins which is used for the majority of buys & golden clams which are much harder to come by & are needed for some of the more extravagant buys (such as having more then 1 worker). Coins are earned by making your unlocked characters do tasks that range in time-scale. For example Chris can spend 1 hour ‘looking for nose goblins’ which will give a modest return in coins or spend 6 hours ‘having private time’ for a much more successful coin drop. It is a good idea to set task of over 8 hours just before you go to bed to maximise your returns. Golden clams can come in several ways but mostly they are dropped in small amounts when completing specific tasks for characters or levelling yourself or the character up. The amount dropped is often so little that any of the big clam buys you want will require weeks of playing or spending real money. As well as gaining coins & clams this way it is also the way to gain XP for characters. The longer the task (Peter dancing the Shipoopi – 8 hours) the more the return in XP & coins, level the characters up to unlock more tasks for them to do. 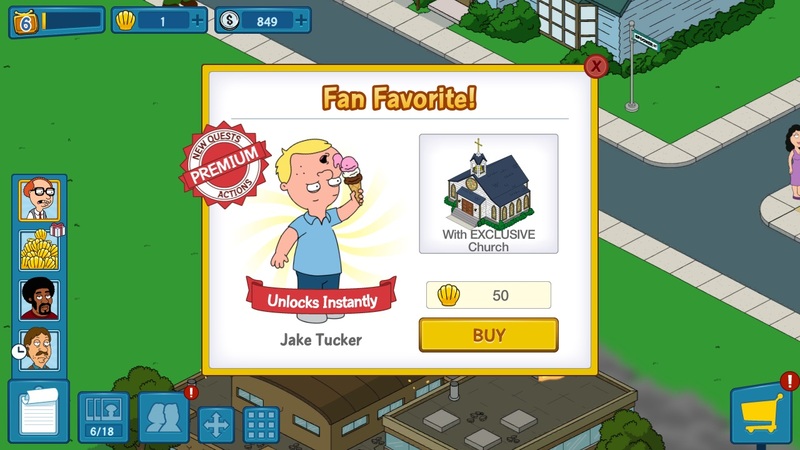 Not all characters are available at the start & you have to often buy a specific building (The school unlocks Joe, the stop & shop unlocks Lois etc.) to gain access to the character. You then have to collect a number of objects that the character wants to actually utilise them in your town. These objects come from the other members tasks as well & are a random drop depending on their task. Thankfully you can see the task that offers you the chance to gain the item taking the guesswork out of it. It sounds long-winded but you’re often so busy constantly assigning tasks & collecting your rewards that it isn’t that noticeable. In-app purchases come in 2 forms: buying packets of coins & packets of clams. They range from a modest amount for £1.49 to a huge number for £69.99. I can see how easily it is to get drawn into spending regularly. I bought a packet of coins for £1.49 & a packet of clams for £1.49 & blew it almost instantly on very little. Golden clams will disappear before you even know it as even speeding up a build or task costs clams. It’s nothing new here as all freenium games have the same set up. Maybe I’m more forgiving to Family Guy because I’m a huge fan of the show & at times the game looks tops. The interactions between characters have all the right Family Guy humour & never feel off. 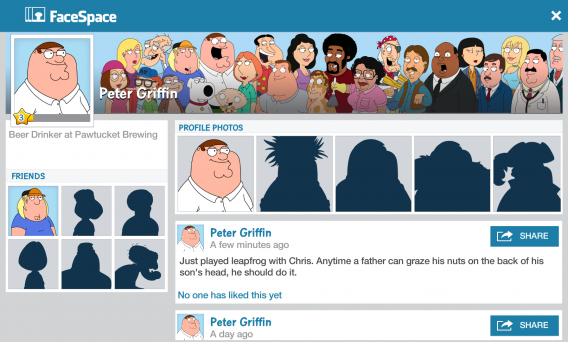 The same goes for the ‘facespace’ site that riffs on Facebook but with Family Guy humour. There is a lot of content to unlock as you progress through the game & with so much to buy as well it’s got plenty of longevity in it. I’m always left with a nagging thought after playing one of these games for a while…I want to support the effort put in but I really can’t get behind freenium games. If they charged a few quid for it & removed all the pay-walls then I would happily buy it & recommend it. Still as a game based around the show it does a pretty good job of making you feel part of it.